A fatal DUI – and the ensuing crackdown on local bars – leads some students to rethink using fake IDs. Faculty support a controversial seminar about 9/11. Budget cuts target a UNC education think-tank. A martial art from Israel comes to UNC. Fake IDs remain common among underage drinkers, but a fatal DUI – and an ensuing crackdown on local bars – has some students thinking twice. In the just-passed state budget, the legislature cut state funds for The Hunt Institute, a think-tank named for Former Gov. Jim Hunt. Though the class has been criticized by conservatives, the UNC Faculty Council passed a resolution to support it and its professor. Summer readings welcome college students to UNC. Past and current books face criticism in conservative media, some more than others. Some UNC students are trying to remove the stigma that often surrounds mental health issues on campus. After an injury ended his career as a UNC quarterback, Kanler Coker has transitioned to a basketball walk-on. Project Krav Maga brings a unique form of martial arts to UNC. The Project’s co-founders say Krav Maga is practical and useful for anyone. Chapel Hill’s homeless shelter is moving from downtown, but that may not reduce Franklin St. panhandling. Two bars face sanctions after a fatal DUI. Boy Scouts bike across the U.S. to honor a cancer victim. Veterans turn old uniforms into paper. 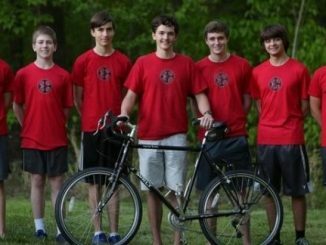 A 4,000 mile bike ride honors young cancer victims and inspires survivors and their families.